Latino Muslims are members of the two fastest growing minority groups in the United States. In this year's presidential election, they face both xenophobia and Islamophobia from the candidates, especially Donald Trump. When N. — a Mexican-American Muslim living in Texas — voted in the her state’s presidential primary on March 1, 2016, she did something she had never done before. She voted for a Democrat. N., a registered Republican who prefers to use her first initial to preserve her identity, said that given all the twists and turns the presidential election has taken so far, Democratic Sen. Bernie Sanders from Vermont was her only option. When Kristina Hernandez goes to vote in the New Jersey primary on June 7, and the presidential election in November, she will be thinking about her 1-year-old daughter, Asiya. Like any mother, she worries about her child’s health, her education, her safety and her future. To mitigate these fears, Hernandez — a 33-year-old Muslim of Puerto Rican descent — plans to vote for Sanders. Nathalia Saldariagga, a 28-year-old Muslim who immigrated to the United States from Colombia in 1997 at age 9, is also concerned about her children. Although she’s protected by the Deferred Action for Childhood Arrivals, or DACA — which allows certain undocumented immigrants who entered the country before June 2007 and before they turned 16 to receive a renewable two-year work permit and exemption from deportation — she worries about each candidate’s immigration policies. Saldarriagga doesn’t want to be separated from her children, ages 5, 3 and 10 months, because of her lack of citizenship. She can’t vote, but she supports Sanders as well. N., Hernandez and Saldariagga are just three of an estimated 250,000 Latino Muslims living in the United States, and their liking for Sanders reflects their individual preferences, not those of Latino Muslims in general. In fact, likely Hispanic voters overall appear to prefer former Secretary of State Hillary Clinton, according to polls. Polls also suggest that the Republican Party’s avowed effort to attract Hispanic voters to their 2016 nominee isn’t working. Latino Muslims are a minority within two minorities. But as members of the fastest-growing ethnic and religious minority groups in the country, N., Hernandez and Saldariagga have heard a great deal of both xenophobic and Islamophobic rhetoric during this election season, mainly from Republican presidential candidate Donald Trump and his supporters and from other Republican candidates as well. Trump, a billionaire businessman and former reality television star, started off his presidential campaign with comments about Latin Americans that many people considered offensive. In November 2015, Trump claimed that he saw Muslims in Jersey City, New Jersey cheering as the World Trade Center collapsed on September 11, 2001. He also proposed a ban on all Muslim immigration to the U.S. following the terrorist attack in San Bernardino, California in December. In 2014, the United States Census Bureau estimated that there were 55 million Hispanics living in the U.S., making Hispanics the nation’s largest minority. There are approximately 3.3 million Muslims living in the United States, making up 1 percent of the population, according to the Pew Research Center. About 6 percent of these Muslims might be Hispanic, according to Alexa Bankert, a Ph.D. candidate at Stony Brook University who studies how identity factors into political behavior. Bankert earned her bachelors of arts in Political Science at Freie Universitaet Berlin before immigrating to the United States. To date, no formal studies regarding Latino Muslim voting patterns have been conducted because the group is so small and, therefore, difficult to study. Bankert said that although a voter’s identity is an extremely good predictor of vote choice, how voters see themselves can be tough for political scientists and polling experts to pinpoint. A voter with dual identities, one who identifies with more than one group, can make predicting voter choice even more complex. For example, not all U.S. residents of Hispanic descent see their primary identity as Latino, Bankert said. In a recent survey of the Hispanic electorate by The Washington Post and Univision News, 57 percent of respondents said they would vote for Clinton over Sanders in a Democratic primary. While 67 percent said they have a “totally favorable” opinion of her, 73 percent said they would vote for Clinton in a general election between her and Trump. Bankert said the Latino support for Clinton dates back to her outreach efforts in the 1970s. In the same survey, only 28 percent of respondents said they would vote for the Vermont senator in a primary. Though 72 percent said they would vote for him in a general election against Donald Trump, just 57 percent would vote for him instead of Marco Rubio, the Republican senator from Florida who dropped out of the presidential race in March. Given that Sanders does represent one of the whitest states in the U.S., he lacks the experience in appealing to minorities. At a rally in North Las Vegas, Nevada with a largely Latino audience in November, Sanders called himself “some guy you’ve never heard of,” according to The Washington Post. On April 6, a particularly windy and frigid afternoon on April 6, 66-year-old Jim MacDonald and his 27-year-old daughter, Sarah MacDonald, from Flushing, New York, were bundled up in winter jackets. The Flushing residents were joined by hundreds of other people on the corner of Hazel Street and South Oyster Bay Road in Bethpage, New York, who were excitedly waiting to board a chartered bus to take them to Grumman Studios. They were all on their way to Trump’s first rally on Long Island, two weeks before the state primary. Young held the poster proudly while facing the line of people congregated next to the bus. One Trump supporter began to viciously chant, “Build the wall, build the wall,” looking directly at Young. Last summer, Univision commissioned a poll to survey the Hispanic electorate on the presidential election. Asked which issues would be most important in deciding a vote, Hispanics ranked the nation’s economy, education, and health care above immigration. However, in the joint Washington Post-Univision poll from February, immigration had become the second most important issue to Hispanics, after the economy. To Hernandez, the issue of immigration is not as important to her as health care. However, she said, it’s still a deciding factor in her voting process. But for 24-year-old political science major Alan Rivera, a Mexican-American Muslim student at Stony Brook, the issue of immigration is still important to him even though he can’t vote because he isn’t a U.S. citizen. Rivera, who converted to Islam after his Turkish stepfather introduced him to the religion, said that he does has personal ties to the issue because some of his family members lack citizenship. 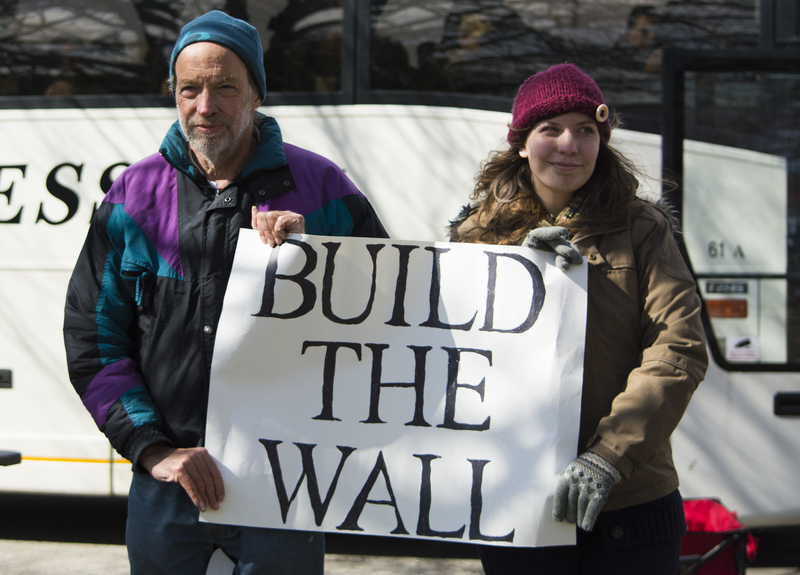 Jim MacDonald, left, and his daughter Sarah MacDonald, right, hold a poster supporting Republican presidential candidate Donald Trump’s idea of building a wall to stop illegal immigration on Wednesday, April 6, 2016 at Trump’s rally in Bethpage, N.Y. Photo by Hanaa’ Tameez. In a poll conducted by the Council on American Islamic Relations, or CAIR, 24 percent of Muslim voters ranked the rise of Islamophobia in the United States as their highest concern. 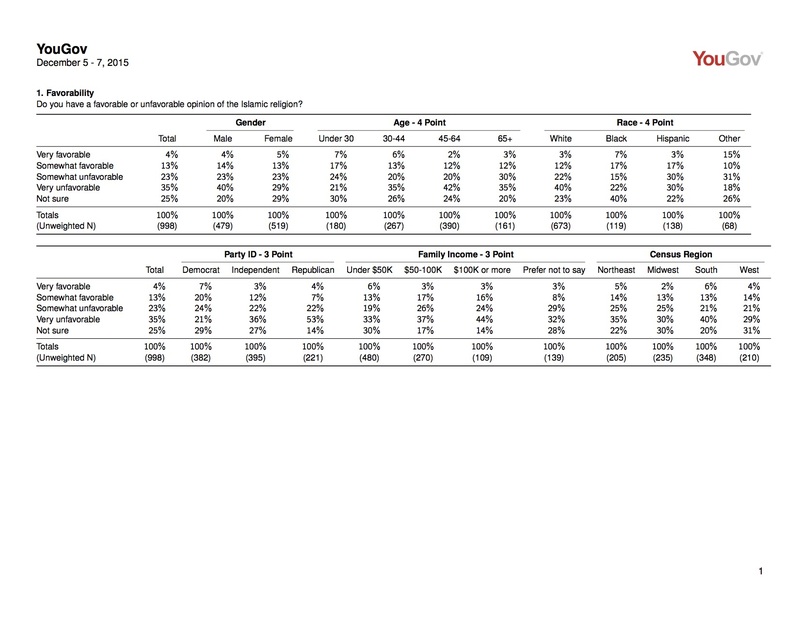 Data from two 2015 YouGov.com polls shows that Americans generally have an unfavorable opinion of Islam. In March 2015, prior to Trump’s campaign announcement, 44 percent of Republican respondents said they held a very unfavorable opinion of Islam. This number increased to 53 percent in the December 2015 poll which was conducted three days after the San Bernardino attack. Unfavorability also increased within Northeast respondents. In March, 24 percent of respondents held an unfavorable opinion of the religion and jumped to 35 percent in December. The rise of Islamophobia in the U.S. is a two-fold issue. Wilfredo Amr Ruiz, a Puerto Rican-Muslim civil rights attorney who also works as legal counsel to CAIR – Florida, said that part of its rise comes from politicians preying on manipulating their constituents. The increase in Islamophobia also stems from the public’s agreement to the political discourse throughout the campaign cycle, Bankert said. However, angry conservative Americans are not the only groups that are motivated by this campaign season. According to The New York Times, the number of naturalization applications has increased 14 percent from June 2015 to January 2016, when Trump started campaigning. The United States Citizenship and Immigration Services, the agency that handles naturalizations, said that it expects one million applications in 2016, which is 200,000 more than the annual average. Ruiz described Trump’s following as a silenced minority that quietly rejected civil rights advancements in the political arena. What’s more concerning to Hernandez and Saldariagga is the support candidates receive after making xenophobic and Islamophobic remarks. Hernandez said she thinks that support for Trump signals disapproval of a shift toward equality in American politics. For Saldariagga, Trump’s success shows her that the U.S. has not made so many strides since she arrived in the country in 1997. In the face of adversity, Latinos, Muslims and Latino Muslims must take advantage of their right to vote, N. said.